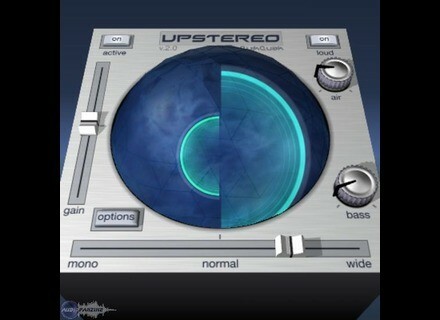 UpStereo v2.x, Surround Sound/Spatialization Software from QuikQuak. 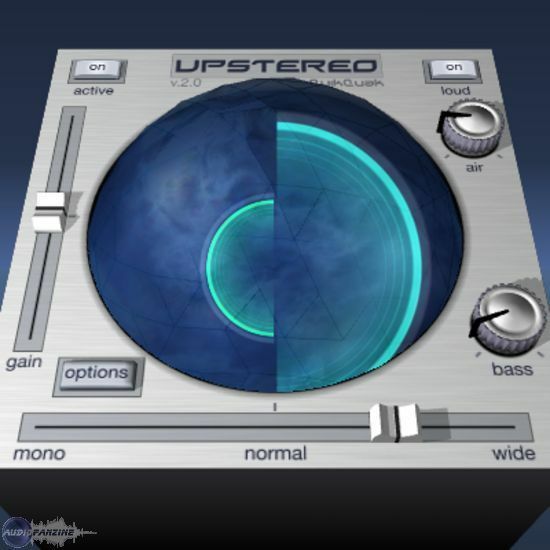 QuikQuak's UpStereo v2 is a free piece of software designed as a stereo enhancer. The plug-in is available for Mac systems and in VST and Audio Unit plug-in formats, so unless you've got the FXpansion VST to RTAS converter as I do, you won't be able to use this in Pro Tools. You can download the plug-in straight from QuikQuak's website and can have the plug-in up and running within a few minutes. I got the plug-in straight from a friend so I didn't download it from their site, although I did go back and try some of the other demo plug-ins they have. As far as the interface is concerned, it's not a difficult one to understand. It's got sliders for gain, stereo width (ranging from mono to wide), bass and air control, as well as a loud button and a cool 3D graphic to show your adjustments. No manual should be necessary as this one should be as easy as any plug-in to figure out on your own. I'm currently running QuikQuak's UpStereo v2 on my system at home, where I've got both Pro Tools 9 and Logic Pro 9. I've used this mostly in Pro Tools, but as I said earlier, since it's not an RTAS plug-in you'll need a VST to RTAS converter like the one made by FXpansion. I've used the plug-in only a handful of times, but I've yet to have any issues at all when it comes to performance. Most will be using it on the master buss anyway, so performance shouldn't be much of an issue in general. Being that it's a free one, it's kind of silly not to add QuikQuak's UpStereo v2 plug-in to your DAW as long as you've got a compatible system. While there are indeed a bunch of free ones out there that serve this same purpose, this will stand it's ground with any of them, as it's one of the best stereo enhancers I've used to date. While this type of plug-in isn't something that I'm going to use very often, when I do I'm definitely going to use UpStereo in the future.